This nearly 11-acre parcel of land was purchased by The 300 Committee in 2011. In the heart of Teaticket Village, the town's most heavily developed and traveled commercial corridor, it is now a permanently protected, natural open space community park. It was the site of Joe's Driving Range, a local attraction and family business for more than 60 years. The private land trust was able to purchase the land with help from a $500,000 state PARC grant and $200,000 in Community Preservation Act funds, along with widespread support from generous members, friends, neighbors and local businesses. The park creation's Phase I was completed in fall 2013. The removal of buildings and several tons of asphalt from the old driveway and parking area was followed by significant grading and soil enhancement. Handicapped accessible park entry paths and a newly configured parking area were installed; 68 tree saplings and 2 acres of grass were planted. 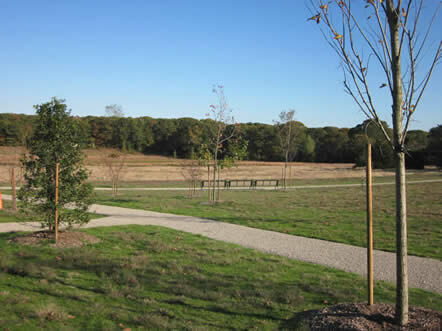 Local contractors Lawrence-Lynch Corp. and Grafton L. Briggs Landscaping were instrumental in the evolution of the park, as was Stephen Stimson Associates Landscape Architects. Numerous volunteers kept the trees and grass watered throughout the summer months. 2014 saw the completion of Phase 2 of the park creation...the expansion of the park pathway system and the restoration of the wetland, which included the installation of a boardwalk and observation platform, both to provide access to and protection for the sensitive wetland habitat. Along with Lawrence-Lynch and Grafton Briggs, local contractors Brown Building Company and Perennial Solutions worked to complete the Phase 2 park elements. In 2015, T3C added a picnic grove and in 2018 is working on the final installation--an outdoor classroom area in the back corner of the park near the Teaticket Elementary School. Three colorful informational display panels located along the walkway's highlight the park's history, habitats and wildlife. We encourage visitors to visit Teaticket Park and to enjoy this lovely open space in the busiest part of Falmouth. Thank you to everyone who has helped support this exciting project, and to all our park volunteers, who work to keep the park clean and beautiful!